If you have been waiting to buy yourself a High-tech drone with a camera, Now’s a good time to grab yourself a deal! The Best Drones with cameras are getting smaller, smarter and more affordable. Many now come equipped with a 4k HD camera mounted on 3 axis gimbals to produce absolutely amazing aerial views. With some practice, anyone can be a great aerial photographer. These new camera drones come packed with the latest new automated flight modes and better obstacle avoidance systems, along with the ability to better recognize and track moving objects. Some even have advanced features like gesture and voice control. While DJI is the most recognized brand in the consumer drone market, other drone makers have also introduced several new camera drones that have advanced capabilities and functionality. So to help you out, We have put together a comparison chart that list the latest hd drone models and the main features that set them apart. We also recommend reading the sections below to be familiar with what you should look for when buying a new drone along with some important information all drone owners should know. Read Reviews– Take time to read some reviews from real customers about the drone. It is a good way to find out about problems and concerns with a particular model. Read the Manual– learn how to operate it safely and understand how to use all the features on your new drone. A foldable quadcopter that combines the best qualities of the Mavic Pro and the Spark. Designed for travelers and outdoor enthusiasts. A foldable drone with an impressive combination of hardware and software that can easily fit in your pocket or backpack. Comes equipped with a 4K camera and 3-axis mechanical gimbal. QuickShot modes offer six different options: Rocket, Dronie, Circle, Helix, Asteroid, and Boomerang, and can be shared to social media via the DJI GO 4 app. It can even be flown without a remote, You can launch, fly, follow and take videos or photos on the Mavic Air using only hand gestures. FlightAutonomy 2.0 gathers data from seven onboard cameras and infrared sensors to construct a 3D map of the environment for more precise hovering and better flight performance. The Mavic Air is compatible with DJI Goggles for first-person-view flight and available in three colors: onyx black, arctic white and flame red. If you want a small Drone with the latest in drone tech then the DJI Mavic Air is for you. The DJI Mavic Air Fly More Combo includes 2 batteries (3 total), set of props (3 sets total), larger carrying case, and a charging hub in a all inclusive bundle. A lightweight easy to transport solution for professionals that are on the go. Considered by many to be the best consumer drone on the market. Comes equipped with dual forward and downward vision sensors for avoiding collisions and to ensure precise positioning during both indoor and outdoor flights. One of the first drones to carry an integrated high-precision miniaturized 3-axis mechanical camera stabilization system. 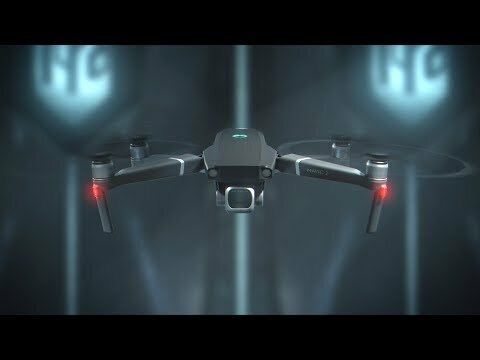 Mavic Pro offers features that can make any beginner look like a pro! The MAVIC 2 Pro has an integrated Hasselblad camera with a 1-inch CMOS sensor and adjustable aperture and the MAVIC 2 Zoom model has a smaller 1/2.3-inch sensor, with the ability to zoom from 24mm to 48mm which allows you to get closer to your subject without actually flying closer. While it’s true, the Mavic 2 series isn’t a massive improvement on the original Mavic Pro, as far as design, it still has the same awesome folding-arm feature and rock-solid construction. Besides having some of the highest quality drone cameras on the market, there are a couple of significant improvements. Both have the new ActiveTrack 2.0 upgrade, which allows the drone to follow moving subjects autonomously with more precision. They are also equipped with OcuSync 2.0, the latest version of DJI’s video transmission technology. The original Mavic Pro only sensed obstacles in front of it, The second generation boasts Omnidirectional Obstacle Sensing that detects and avoids obstructions on all six sides for increased safety. Advanced Pilot Assistance Systems (APAS) avoids obstacles in front of and behind it. The Mavic 2 offers the best camera quality of any folding drone in its class. This drone comes with a Built-in digital 3-axis stabilization system and high-quality 1080p camera that produces 14-megapixel images. A lightweight and unique design for those looking for a cheaper FPV alternative with a descent flying time. Two autonomous modes: Flight Plan (follows a pre-plotted flight route) and Follow Me mode. You can use its FreeFlight Pro app to save and store your photos, videos, routes, and other types of drone information. You can also control the Bebop 2 with just your Apple iPhone or Android device. If you purchase the Bebop 2 Power FPV Pack, you will get the Skycontroller 2 that extends your range to 2000 meters as well as Cockpitglasses for an immersive FPV experience and two 30-minute batteries for up to an hour of flying fun. The Bebop 2 offers you an all-inclusive drone package with FPV capability at a budget friendly price. Designed to meet four essential needs: Image quality, flight performance, portability and ease of use. The first drone equipped with a 3-axis gimbal stabilizer that has 180 degrees of vertical tilt freedom. Which means, not only can this drone look straight down, it can also look straight up. ANAFI has a 4K camera capable of shooting HDR video with 2.8x lossless zoom and a 21MP sensor. All the controls and features are accessed through the drone’s app: FreeFlight 6. Anafi is also outfitted with a range of smart filming and flight modes. Besides the standard modes, like auto-follow, orbit, and waypoint flying. Others, like Dolly Zoom, Hyperlapse and Slow Motion are not as common. ANAFI has a 25 minute flight time and a range of up to 2.5 miles. The Geofence option lets you define your own virtual perimeter, stopping ANAFI from flying out of a designated area. The first consumer-level drone on the market with HDR video capabilities. Zoomable camera, You can magnify up to 2.8x in “Lossless” mode. Video modes; Hyperlapse and Slow-Motion are innovative features that require no editing. Find My Drone- Make it beep at the tap of a button or find it on the map to locate and retrieve it. Even though it has no internal memory outside of the microSD slot and no obstacle avoidance. New from Autel, is a quadcopter packed full of intelligent flight features and equipped with a top quality 4K HD camera mounted on a 3-axis stabilized gimbal. Also has intelligent flight modes and obstacle avoidance thanks to 2 Front & 2 Downward cameras (Computer Vision) and Rear (IR Sensor) for backward obstacle avoidance during selfie shots. Like many other compact camera drones, EVO creates a 3D environment and reacts to obstacles that are in the way. With Dynamic Track, Obstacle Avoidance and 3D Mapping Technology, EVO takes safety and stability to the next level. EVO boasts 30 minutes of flight time and 4.3 miles of range. Includes 3D software that will make it easy to use for making 3D maps. Occlusion handling—Handling obstacles, such as tree cover, that get in the way during a shot. A well built drone with features that rival those of higher priced models. The first quadcopter to incorporate a new sliding-arm technology. Comes equipped with one of the world’s smallest 3-axis stabilised camera gimbals that can capture amazing 13Mp photos and video footage in 4K. This Folding Drone is packed with one touch smart features, Circle Mode, Rocket Mode, Dronie Mode, Advanced Follow me mode, Return Home, Burst mode, Time Laps, Slow Motion and Gesture Recognition. The first compact drone capable of shooting videos in time-lapse and slow motion, without requiring any form of additional editing. Made with aviation aluminium alloy, it is not only compact but extremely robust. The sliding-arms hide the props inside the body and can be coupled onto the controller for an easy-to-carry package that can be slide into the included GDU carry bag. This also means it can be stored together as a complete unit. The Obstacle Avoidance System helps the GDU O2 to see objects in its path and automatically stop at a safe distance. Thus allowing you to focus on capturing the perfect image rather than worrying about crashing. The advance vision positioning systems enables the drone to keep fully stable in both an outdoor and indoor environment and also recognize objects below the drone to insure safe landings. Smart Features – including gesture recognition controls for shooting photos and video. The GDU O2 Drone offers a unique portable design and an affordable price. The company Halo Board headquartered in Los Angeles California, designed the Halo Drone Pro, their first drone for the consumer market. Designed with foldable arms much like the DJI Mavic Pro and has all the best features in a single, very stylish, portable design. Offers 22 minutes of flight time and cutting-edge technology that will satisfy most pilots. Includes a cool wearable controller that you simply put on your wrist to tell the drone where you are and follow you. It also has an interchangeable camera gimbal that’s compatible with GoPro Hero cameras. The included camera is able to capture great footage in 4K at 30fps, The flight app is packed with features such as customizable Route Planning. This allows you to set flight paths on the map and the drone will autonomously follow the route. As an added bonus, the Halo Drone Pro comes packaged in an awesome backpack case so you can safely transport your rig around with you! The Halo Drone Pro is one of the best drones on our list, the Halo Drone Pro somehow manages to mix all the best features in the drone market into a single, very stylish, portable design. Water-resistant watch remote allows you to have follow controls while you bike, board, or ride! Comes with its own hard-shell backpack case — keep’s everything’s conveniently stored together in one location. The Halo Drone Pro has some nice features, but like the parrot ANAFI Drone, it has no obstacle avoidance. But hey, all pilots should learn to depend on their skills rather than technology anyway. A machine designed for those who take their aerial photography seriously. Equipped with a 3-Axis Mechanical Gimbal and a 1-inch CMOS camera that can shoot 4K video at up to 60 frames per second, and 20 megapixel still images. Uses Lightbridge video transmission technology, which provides a live HD video feed from the camera from up to 4.3 miles away. Equipped with a 5 Direction obstacle avoidance system. Using its sensors, the P4 Pro continually scans the environment around it and alerts you when you fly too close to an obstacle, then maneuvers to avoid it autonomously. Besides the latest in obstacle avoidance, The Phantom 4 Pro has all sorts of advanced features that include a range of new Active Track abilities. You can set the P4 Pro to orbit a point in space with Point of Interest Mode, repeat flights along a preset path with Waypoints, follow your movements via Follow Me mode, or even adjust the way it responds to joystick control with Course Lock and Home Lock. A new dynamic return to home function. When you press the return to home button, the drone will “reverse” along the same path it used to get where it is — dynamically avoiding any obstacles that might appear along the way, of course. It’s not totally crash-proof, but the technology is coming along. The Phantom 4 Pro offers the most autonomous intelligent flight modes of any drone. If you want Professional performance and features, the DJI Phantom 4 Pro is the drone for you. The Phantom 4 Pro V2.0 inherits all the earlier smart features including obstacle avoidance and a 30 minute flight time. Comes equipped with the same 1-inch 20-megapixel sensor capable of shooting 4K/60fps video and Burst Mode stills at 14 fps. Most notable are the use of quieter props and the upgrade to OccuSync technology instead of Lightbridge. This change not only improves the transmission system that communicates between the remote control and the drone. It also allows you the option to connect DJI Goggles wirelessly. You can buy the Phantom 4 Pro V2.0 with a standard controller for just under $1,500 and the controller with a built-in 5.5″ monitor will cost you around $1,800. If you already have a Phantom 4 Pro then you may want to consider ordering the new style props for quieter, more enjoyable flights. Note: If your on the fence about which DJI Drone to choose, they have a great comparison page that lets you Compare Different DJI Consumer Drones side by side. The Mantis Q from YUNEEC is a foldable drone that features voice control and facial detection in a small portable package. When folded together, the Mantis is little enough to fit in a ladies bag or a guys jacket pocket. This quadcopter offers 33 minutes of flight time and a “sport mode” that allegedly allows it to reach up to 44 miles per hour. Comes with a 4K camera that has electronically-stabilized 1080p resolution and can be tilted upwards 20 degrees or downwards 90-degrees during flight. Responds to several voice commands such as “Wake up” for powering on, “Take a picture”, “Record a video” and “Take a selfie”. Simply smile at the drone to activate face detection and as soon as the Mantis Q “sees” the user’s face, it will take a photo from up to 13 feet away (4m). In Gesture Control mode, Mantis Q will detect a hand waving and it will take a photo. It has no Obstacle Avoidance, but the dual sonar sensors and infrared detection are adequate for flights indoors, without the aid of GPS. If you are looking for a light, easy to use drone for capturing photos and video while traveling or just exploring the great outdoors. The Mantis Q from Yuneec is a good choice. Flying one of these new high tech gadgets is not a problem for most people, the real challenge is deciding which drone to buy. If your a beginner, These teched out drones are probably a little pricey to start with. You may want to start with a cheaper drone that is less expensive but still offers good quality videos and pictures. Your options will depend on what your willing to spend, So be sure to include any additional accessories. Definitely add extra batteries and props, perhaps a carrying case or backpack for traveling. I find you can often get a good price by purchasing a drone bundle deal. They include popular accessories and some have different lens that you know will work with your new drone camera. Once you have a price point, it is easier to find a model that fits your needs. 1. Appearance – Let’s face it, looks matter, even when it comes to buying a drone. There are many shapes, sizes and colors, so start with what appeals to you, just keep in mind it’s intended use. Will it be used for home videos or professional photography? 2. Flight Ability – This includes flying time per battery, flight range and safety features. Auto Return Home (RTL), Low Battery Return, and Pause-and-Hover modes are now available on many models. 3. Camera Quality – This includes the megapixels and video resolution. When it comes to resolutions “more is better”, 4K resolution has become the standard for aerial photography drones. 4. Gimbal – The gimbal provides camera support. It helps keep the camera steady in flight. It’s main purpose is camera positioning and image stability. Mechanical Gimbals are the most common gimbal systems. The 2-axis and 3-axis ones, use miniature brushless motors and a bunch of supporting algorithms and gyroscopes to accurately level out the camera during flight. Electronic Image Stabilization is software used to remove some of the jitter caused by the drone in flight. EIS essentially does the same thing as a mechanical gimbal – EIS stabilizes the footage by zooming it in and then using algorithms to level it out. EIS vs Mechanical Gimbals: So, as far as quality of stabilization is concerned, mechanical gimbals beat EIS for eliminating that nasty jello effect and a 3-axis is better than a 2 axis gimbal without much question. 5. Flight Controller – Some of the high-end drones come with a controller that already has a display built into it. While others have a bracket on the controller that allows you to secure a smartphone or tablet. A downloaded APP then allows for full control of the drone. Each manufacturer has their own app such as the Go 4 app from DJI. Most are available in the APP STORE. 6. Integrated GPS Autopilot – This feature enables your drone to know it’s “place in space” and enables it to return to home. You can also create a flight plan by drawing waypoints on a map and let the drone fly on autopilot while you maneuver the camera to capture the best shots. 7. Real-Time object avoidance systems – This is the drone’s built-in capability to “see” the surrounding terrain in 3D and avoid objects within it, in real time. The newest camera drones can literally see objects in their flight path and automatically route a new course around them. 8. Advanced Camera Control Software – This is where the drone is able to autonomously pilot itself in a predetermined flight pattern. The new higher end drones come packed with intelligent flight modes, such as Follow me, Way points, Point of interest and many more. Here are a few of the most common asked questions about camera drones. Are These Drones Hard To Fly? These higher end drones tend to be easier to fly because most have GPS positioning and intelligent flight modes like one-key return to home, automatic take off/ landing. Many now have obstacle avoidance which means they can basically fly themselves. How do I save pictures and video from the drone? Most drones either come with or require an SD card for the purpose of saving and storing pictures and video from all your flights, which can then be uploaded onto a laptop or PC. What is the best consumer camera drone on the market? The best drone overall has to be the DJI Mavic Pro 2 because it's portable, offers the best features and comes with the best small cameras to date. How much can I expect to spend on a drone with a camera? At least $600.00 on a unit with a 4k camera, while the newest models with more features have an average price of around $1,400.00. Are drone batteries allowed on airplanes? In terms of domestic flights within the U.S., you are generally allowed to take up to 3 batteries in your carry-on luggage provided they are below 100-watt-hours each. For international flights, the rules can vary. It would be best to check the airline’s website for specifics. Why buy a drone with a camera? Use it on vacation to get amazing shots of those special times with friends and family. Capture footage of yourself kayaking down a raging river or riding a bicycle through the mountains. A drone with a camera can prove to be a very useful gadget around your house or farm. You can take an aerial shot of your property to get a better perspective of it's layout for future planning and check your home and buildings after a storm for damage. Your drone is the perfect tool for getting eyes on that hard-to-reach part of your property, not to mention that their just a lot of fun to fly. Safety Rules you need to follow when you take to the air in the US. Stay 5 miles away from airports. Fly your drone at or below 400 feet. You’re required to keep your drone within your line of sight. It is illegal to fly your drone in or around a wildfire firefighting operation or hurricane recovery efforts. Fly responsibly- respect the privacy of others. If your new drone weighs more than half a pound, you’ll need to register it with the FAA as a Model Aircraft. Registration costs $5 and is valid for 3 years. The FAA also requires you to mark your drone with your registration number in case it is lost or stolen. Please make sure to follow all the safety protocols and obey the laws for operating your drone. Not all countries regulate drones in the same manner. Learn about and stay updated on the current laws of your specific country and locality. Do I still have to register even if I just fly my drone in my own yard for fun? Yes, so long as your drone weighs 250 grams or more. What if I have multiple drones, do I need to register all of them? No, You’ll only need to register one and then simply apply that number to all the drones you own over 5.5 ozs. My choice is AirMap, available for smartphones and on the web, which shows you exactly where you’re allowed to fly and where your not, with tools for both recreational and commercial pilots. What if I want to use a drone for commercial purposes? In the US, If you use a drone and receive any form of compensation, including the exchange of goods and services. You need to have certification from the FFA to do it legally. For more details, see this post “How to Profit from the Air Drone Craze“. If you are going to take this seriously and not just be a hobbyist, you need to consider going through the process to get certified. In the US, it requires becoming a part 107 certified sUAS (small Unmanned Aircraft Systems) pilot. Each country has their own aviation authority you can contact in order to acquire a certification or license. So to wrap things up…. What’s the best drone for sale? Without question, The Mavic Air is a top pick right now, DJI has released some fantastic drones and with all things considered in terms of size, features and price, At $800, it’s hard to ignore the incredible set of features offered in this compact camera drone. Look’s like 2018 will go down as another exciting year in the drone craze, With many new drones with cameras being introduced with great features and reasonable prices. Check back for updates to this list as new drones become available.